Today we will discuss about Cochran boiler. 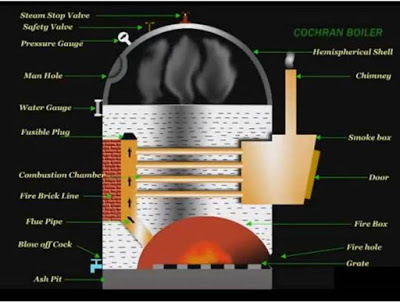 Cochran boiler is a modified form of fire tube boiler which has various fire tubes which exchange heat to water through convection. It is used in small power plant and industries. It is a simple fire tube boiler which has multiple fire tubes. These tubes increase the heat transfer area of boiler. Water passes over the tubes. The heat is transfer from fire tubes to water through convection. The area where flue is placed known as grate. It is at the bottom side of the boiler. The combustion chamber is connected to the furnace. There are various fire tubes which one end is connected to the furnace and other by chimney. The small hole is provided at the bottom of combustion chamber to place fuel is known as fire hole. 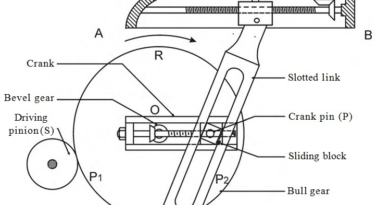 It works as a mediator of fire tubes and combustion chamber. It is also has dome shaped top. The main advantage of this shape is that it deflects back the un-burned charge and flue gases to the combustion chamber and furnace. The flue gases leave atmosphere through chimney. The brick lining outside the combustion chamber prevent the overheating of it. Along these parts Cochran boiler equipped with following mountings and accessories. Cochran boiler works as same like other fire tube boilers. It can be understand by following points. Coal is placed at the grate through fire hole. Air is entering into the combustion chamber through atmosphere. Flue gases start flowing into the hemispherical dome shaped combustion chamber. This flue gases further moves into the fire pipes. Heat is exchange from flue gases to the water into the fire tubes. The steam produce collected into the upper side of the shell and taken out by when required pressure generated. The flue gases now send to the chimney through fire box where it leaves to the atmosphere. Now this process repeats and run continuously. The steam generates used into the small industrial processed. 1. Low floor area required. 4. It is easy to transport from one place to another. 5. It has higher volume to area ratio. 1. Low steam generation rate. 2. Limited pressure handles capacity. 3. It is difficult to inspect and maintenance. Today we have discussed about working, construction and advantages and disadvantages of Cochran boiler. If you have any doubt or query regarding this article ask by commenting. Which boiler is most preferable between fire tube and water tube? Depending upon the usage. If high pressure requirements are needed that water tube boilers are preferred.